Everyone has a right to their feelings. That is a statement that has been ringing in my ears of late. One reason is because I am often accused along the lines of ‘you can’t seem to find peace else why would you write the things you do?’ Another reason is because I think the right to feel is fundamental to the resolution of conflict in our lives. It took me a long time to understand the depth of the statement. Everyone has a right to their feelings. This means that we must accept the fact that people’s feelings are the result of their interpretation of the actions or situation they are in. You simply cannot tell a person how they should feel. Going deeper, this right to feeling means that all feelings are legitimate emotions. Those that we call negative emotions, anger and fear for example are just as valid as the positive ones like love and joy. We humans feel these emotions, it’s part of the software in our operating system. So what does this have to do with seeking peace? Quite a bit actually. Another human condition that often occurs is called conflict. It happens all the time because we are all different and we all look at things differently. Conflict is inevitable. There are going to be times you disagree. At work, in a marriage, in virtually any aspect of your life conflict is sure to occur. Early in my life I learned to deal with conflict in what I would now call a non-productive way. If there was any conflict that resulted in an increase in passion, I felt I had to avoid it. Let me pontificate. even though we both wanted it to work. It just seemed like there was this background angst in our relationship that just wouldn’t go away. We loved each other, but there were things that each of us did that just bugged us both time after time. I personally finally broke down and realized maybe a little professional help was in order. My wife was first to the conclusion, it took me a while to accept that fact. In counseling the idea that everyone has a right to their feelings was the first lesson we learned. When we started putting this into practice, it changed the way we approached conflict. You start with the phrasing. When you are upset and trying to say why, you don’t blame the person. For example if you feel like you are not respected, you don’t say, “you disrespect me!” Instead, you say, “this ‘____’ that you did makes me feel disrespected.” If you think about it the second version is the more true statement. Simply because you are feeling like that person doesn’t respect you and it is because of a particular action. The first communication puts the person immediately on the defensive, while the second allows for the consideration of feelings no matter what the cause. Now consider you are the person receiving the criticism, if you look at that statement and allow that person to feel the way they feel no matter what, three things happen. First, you realize that ultimately how they feel is something you cannot change that is their prerogative not yours. Second, simply by stating the reason for the feeling, this gives you a chance to understand where that person is coming from. Ultimately, you realize that you can modify your behavior or explain your actions and that gives the other person a chance for a new interpretation. Following this advice may or may not affect how the other person feels, but that isn’t the point. The point is simply that the communication occurs. I have found that this technique can happen at the top of your lungs and it still works, the room can be flooded with anger and emotion and it still allows conflict resolution. It works far, far better than avoiding the emotion. Here’s why I think that happens. All emotions are valid so to constantly stamp out the anger or frustration just postpones the problem till later. We humans are often as emotionally driven as we are logically driven. We need to accept that, not reject it. There aren’t good or bad emotions, just good or bad actions. If a person is angry at you, it doesn’t matter if you think they have a right to be angry or not. That is ultimately a moot point. This means it is totally unproductive to challenge that persons right to ‘feel’ the way they do! What is productive is understanding why a person feels the way they do. This means it is better to ask why these feelings occur. If you both are able to ask why the feelings exist and both of you can reply honestly about the source of your emotion, then there is a chance for understanding. Over the years I have discovered that you don’t even have to agree with each others reasons for feeling how they do, you just need to be honest about them. Hiding your reasons or avoiding the issue only breeds resentment.I used to believe that that emotional conflict with fear and anger was something evil and to be avoided. I realize now that isn’t the case. Emotions are part of us, all of us. Conflict will happen, it is inevitable. avoiding it as a solution to the problem doesn’t bring you together. It drives you apart. I personally know for a fact learning this concept saved my marriage. We are as different as two people could ever be, and yet, our love is as deep as it can get. I still annoy her, and she still does things that bug me. The difference is now we accept those facts because we understand each other (even joking about it often). There is no mumbling when the others back is turned. There is no buried resentment that I sometimes observe in couples that have hung together even longer than we have. Our understanding is founded in (sometimes brutal) honesty and the right to feel. If there were one legacy I could leave on this planet it would be this. -Trust the ones you care about enough to be honest about where your feelings come from. Then remember that we each have rights to our feelings. Abiding by this will allow you to discuss the problem not run from it. Love will flourish in spite of differences. Remember always that feelings matter and you will then find the peace you seek! 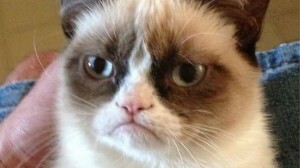 I count it as a personal bonus that I got to put an appropriate picture of angry cat in a post! You can’t be an internet success without paying homage to the cat! Next Post What Do You Believe Now?